Along with Pablo Picasso and Henri Matisse, Salvador Dali (1904 – 1989) is widely regarded as one of the greatest artists of the 20th century. Though he experimented with several art styles, Dali is most renowned as a Surrealist artist who created many of the best known paintings of the movement. A major influence on Dali’s work were the theories of famous Austrian psychoanalyst Sigmund Freud. His Surrealist paintings were full of imagery that drew from Freudian symbolism, as well as his own subconscious. Among the most important contributions that Dali made to the Surrealism movement was the paranoiac-critical method, in which he attempted to tap into his subconscious through systematic irrational thought and a self-induced paranoid state. Though Dali continued to work late into his career, critics believe that he was past his prime with recurring motifs appearing through his work. 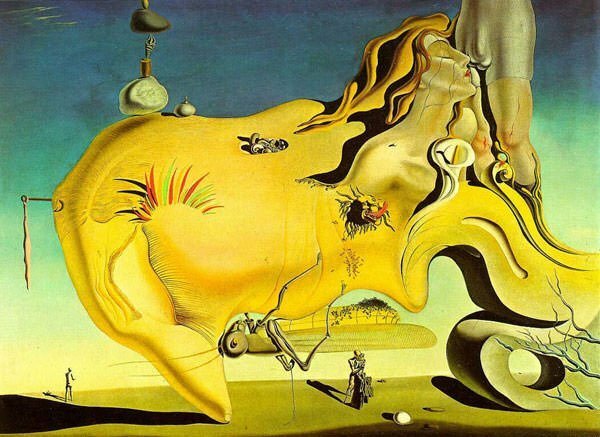 Let’s delve deeper into the art of Salvador Dali by studying his art style. In his initial years, Salvador Dali experimented with various styles of art ranging from Impressionism, Pointillism, Futurism, Purism, Cubism and Neo-Cubism. He tried to improvise these styles of art but this didn’t gain him any fame. It was in Surrealism that Dali finally found the method to express his imagination and attract the attention of the art world. Surrealism was an influential 20th century movement, primarily in art and literature. Surrealist artists rejected the rational in art; and instead aimed to channel the unconscious to unlock the power of imagination. Salvador Dali went on to become the leading as well as the most financially successful Surrealist artist. The famous Austrian psychoanalyst Sigmund Freud had a great impact on the Surrealism and many works of the movement were inspired by his theories. Freud’s psychological view that one’s fantasies shape their dreams and delusions fascinated Dali and became the pivot for his Surrealist work. Dali’s Surrealist paintings were full of imagery that drew from Freudian symbolism, as well as his own subconscious. Salvador Dali joined the Surrealist movement in 1929 and the same year, he created the distinctive works, The Enigma of Desire and The Great Masturbator, which were stamped with originality and the ability to shock; hallmarks of the Surrealist school of art. Salvador Dali attempted to capture his extravagant imagination in his art. Illusion, dream and imagination were central to his Surrealist paintings, which he described as “hand-painted dream photographs”. 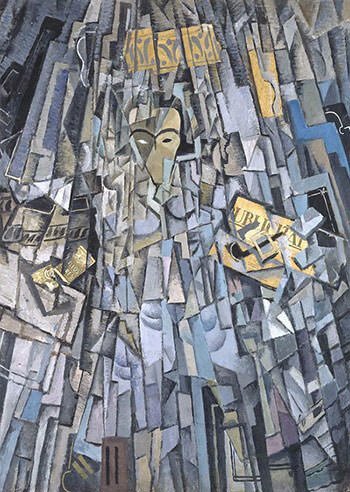 Among other things, his paintings had a hypnotic quality to them. Dali, unlike other Surrealists, also introduced elements of autobiography into his art. Moreover, his works were stamped with experiments in space and lighting. In the early 1930s, Dali developed the paranoiac-critical method, which is regarded as his most important contribution to Surrealism. It was a technique through which the artist attempted to tap into his subconscious through systematic irrational thought and a self-induced paranoid state. To achieve this state Dali would often stand on his head until almost passing out. The aspect of paranoia that was of most interest to Dali was the ability of the brain in that state to perceive links between things which are not linked rationally. In the words of Salvador Dali, the paranoiac-critical method was a “spontaneous method of irrational knowledge based on the critical and systematic objectivity of the associations and interpretations of delirious phenomena”. 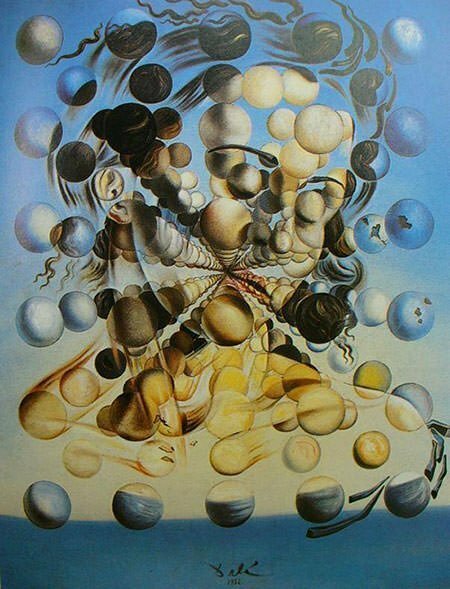 Dali used the paranoiac-critical method in several of his best known Surrealist paintings, especially those involving optical illusions and other multiple images. Double images were a major part of Dali’s paranoiac-critical method. His 1937 paintings Metamorphosis of Narcissus and Swans Reflecting Elephants are perhaps the most famous examples of double images in his paintings. According to Greek mythology, Narcissus, who was renowned for his beauty, fell in love with his own reflection in water. Dali’s interpretation of the Greek myth, Metamorphosis of Narcissus shows Narcissus sitting in a pool, gazing down. In Swans Reflecting Elephants, Dali again uses the reflection in a lake to create a double image. The three swans in front of the trees are reflected in the lake so that their necks become the elephants’ trunks and the trees become the legs of the elephants. The atomic bombing of Hiroshima and Nagasaki brought about a new period of artistic exploration for Salvador Dali known as “Nuclear Mysticism”. He became fascinated with the powers of modern science and incorporated scientific elements into his art. He also became more interested in optical illusions and religion. Dali’s post World War II period was marked by technical brilliance combined with fantastic imagination. Inspired by science and religion, he created images depicting divine geometry, the DNA, the Hyper Cube and religious themes of Chastity. However, critics believed that he was well past his prime by that time. His later work has been criticized for lacking in originality. It is also said to have dried up in terms of creativity with recurrent motifs appearing through it. 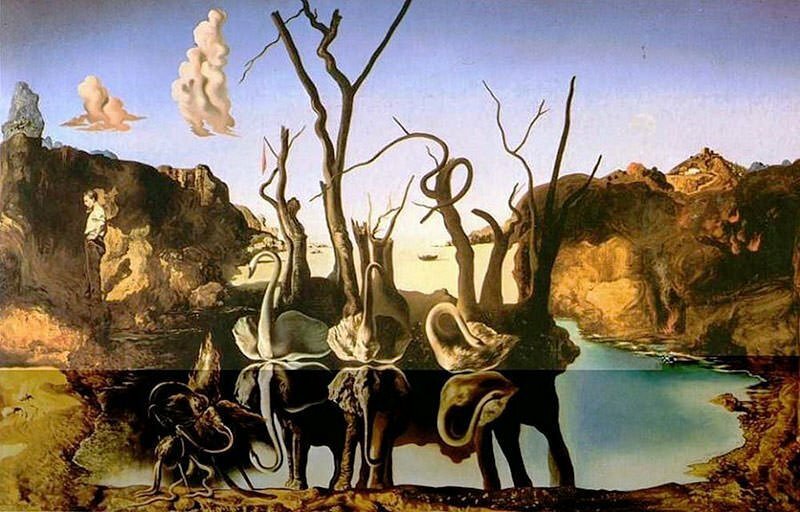 The most celebrated works of Salvador Dali are hallmark pieces in the Surrealist style- revealing the coming together of a hallucinatory, illusory quality with repeated symbols; like fruits, clocks, eggs, elephants and ants. The symbolism in Dali’s work is unmatched. It often delves into the subconscious and unconscious mind. Let’s take a look into his most used symbols. Elephants were represented in his art as weightless, long animals with spindly legs that almost gave them the quality of floating or fragility, despite power and strength. His elephants have an air of levitation as if they were extremely light. Ants appeared in his works as a symbol of grotesque decay. They were also often considered to be symbols of mortality or overwhelming sexual desire. Clocks in Dali’s works are always melting or distorted – as a means of representing the fluidity and subjectivity of time and its immense bearing on human experience. Eggs appeared in Dali’s work as symbols of hope and love, with their hardened exteriors and soft interiors. Drawers and shelves in his work represent the spilling out of secrets. The Persistence of Memory (1931) is not only the most famous painting of Salvador Dali but also the most renowned artwork in Surrealism. It is also considered one of the greatest masterpieces of 20th century art. The painting depicts a scene with watches melting slowly on rocks and the branch of a tree, with the ocean as a back drop. Dali uses the concept of hard and soft in this painting. This concept may be illustrated in a number of ways like the human mind moving from the softness of sleep to the hardness of reality. 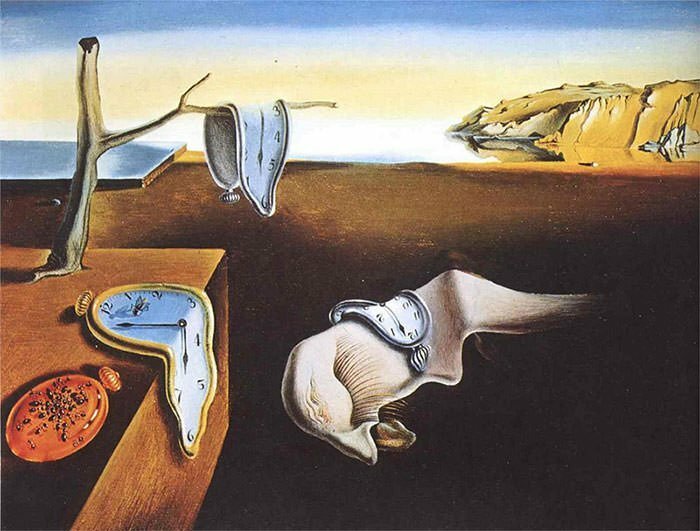 In his masterpiece, Dali uses melting watches and rocks to represent the soft and hard aspects of the world respectively. The Persistence of Memory has been much analyzed over the years as Dali never explained his work. The painting forces the viewer to pay attention to time and space by distorting its boundaries. Its eerie dreamlike quality became a sharp comment on the human mind and how it interprets and experiences time, space and reality. Critics across the art world have attributed varying meaning to the painting, with some saying that it represented Einstein’s Theory of Special Relativity while others looking at it as a symbol of decay and disintegration.